We are going down under again! 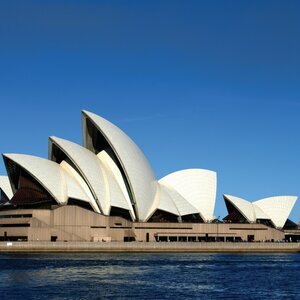 Enjoy a guided tour of the Sydney Opera House and an afternoon cruise of the famed Sydney Harbour! 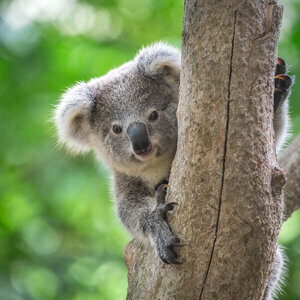 See the World Heritage-listed Blue Mountains, and cuddle up with a friendly Koala! 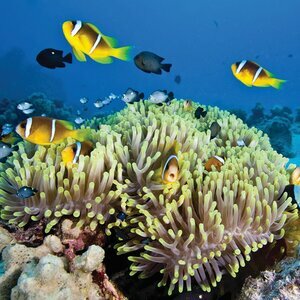 Spend a relaxing day at the Great Barrier Reef. 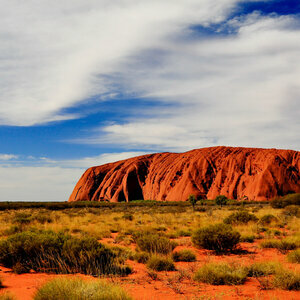 Enjoy a champagne sunset at Uluru (Ayers Rock), then get up early to see the sun bring color back to this famous rock! 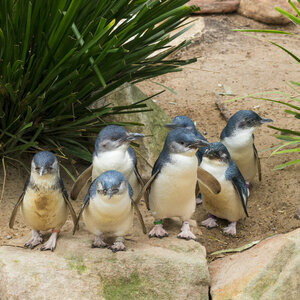 Watch the world’s smallest penguins emerge from the sea at the Phillip Island Penguin Parade. All of that and more, followed by a wonderful two-week cruise to New Zealand aboard Princess Cruise Line's “Ruby Princess”. What a wonderful way to celebrate my 79th birthday and our 57th Anniversary. Thank you to Koral who worked so hard to make our trip “down-under” all it could be! Dungeon tour was fantastic. Outback supper and performance was out of this world. Our second tour with WestWorld Tours. Not a disappointing moment in every tour. Thanks for showing us the sites and capturing the most important moments (sunsets, sunrises, stars on the other side of the world). We are going down under again! 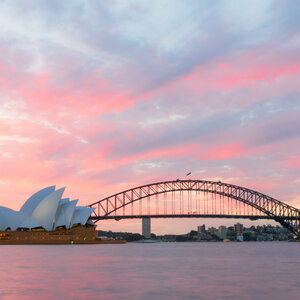 Enjoy a guided tour of the Sydney Opera House and an afternoon cruise of the famed Sydney Harbour! 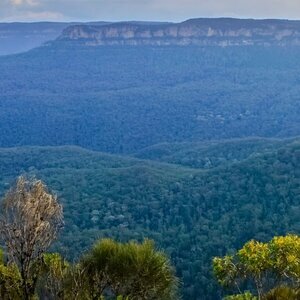 See the World Heritage-listed Blue Mountains, and cuddle up with a friendly Koala! 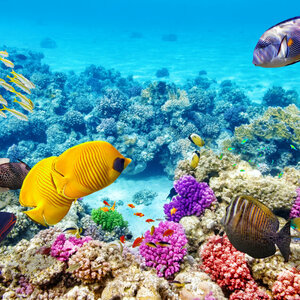 Spend a relaxing day at the Great Barrier Reef. 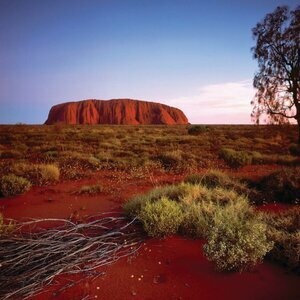 Enjoy a champagne sunset at Uluru (Ayers Rock), then get up early to see the sun bring color back to this famous rock! 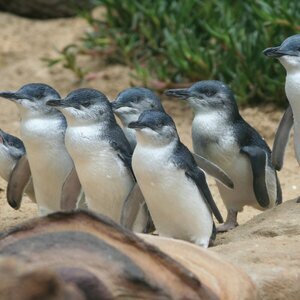 Watch the world’s smallest penguins emerge from the sea at the Phillip Island Penguin Parade. All of that and more, followed by a wonderful two-week cruise to New Zealand aboard Princess Cruise Lines “Majestic Princess”. Day 2 will be lost in flight but regained on the way home. Arrive Sydney and transfer to hotel. We expect to arrive to the hotel about noon. Enjoy lunch or join our WestWorld tour director for a leisurely walk to stretch our legs until our rooms are ready. The rest of the afternoon is free to allow you time to relax & refresh after our journey. 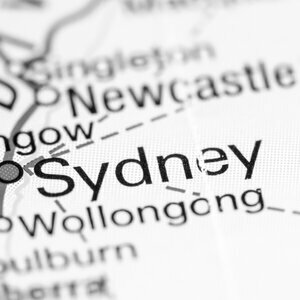 Our hotel is centrally located in Sydney’s CBD with views of the world famous Sydney harbour. This evening enjoy a chance to get to know your fellow travellers at our Welcome Reception. A fantastic city tour is planned today which includes the historic Rocks district, Chinatown, Bondi Beach, a guided tour of the landmark Sydney Opera House, and an afternoon Seafood Buffet Cruise. Later enjoy some free time. Today we have a full day planned. 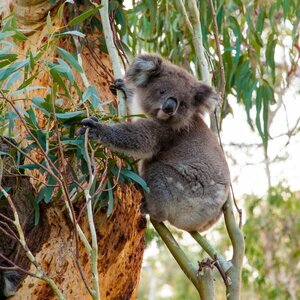 First, we have the chance to encounter Australia’s native wildlife up close – perhaps feed a kangaroo or cuddle up with a friendly koala at Featherdale Wildlife Park. Then we’re off to the World Heritage-listed Blue Mountains where we’ll enjoy breathtaking views and have the chance to ride the steepest passenger railway in the world. Today, we fly to Cairns, the gateway to Queensland’s tropical north and the Great Barrier Reef. Tonight you may want to check out all the great shopping and food in the night market!! The Great Barrier Reef can be seen from space. Now you can see it up close. We have a full day adventure planned as our fast, air-conditioned catamaran cruises us out to Green Island. There we can snorkel, view the reef from a glass bottom boat, go for a swim in the crystal clear water, or enjoy an Eco Island walk. A buffet lunch is included today. 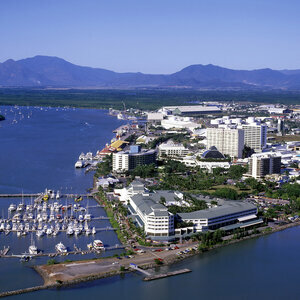 Today enjoy a well deserved free day in Cairns. Our morning flight takes us to Australia’s Outback! Uluru is one of Australia’s most recognizable natural icons, and a must-see for many! The world-renowned sandstone formation stands 1,142 ft high, 2,831 ft above sea level with most of its bulk below the ground, and measures 5.8 miles in circumference. Our tour this afternoon will include the equally impressive Kata Tjuta, or the Olgas, as well as a stop at the Culture Centre. This evening we’ll enjoy an unforgettable champagne sunset!! one sunrise you don’t want to miss!! Then it’s back to our hotel for breakfast, before departing for Alice Springs. This evening we’ll get to experience the solace and tranquility of this harsh land at the Outback BBQ where we’ll have the chance to meet local people and learn their stories of life and survival. 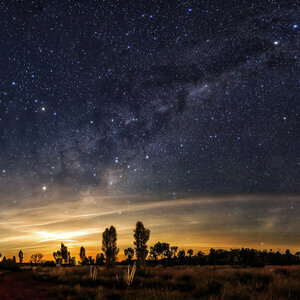 We’ll enjoy a boomerang demonstration, listen as a bush balladeer sings timeless Australian songs, hear from local cattlemen and Indigenous people, and have a local astronomer show us this southern night sky! All this while enjoying an authentic Australian feast. 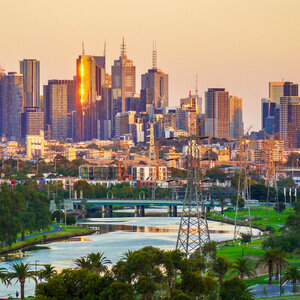 Today we have time to visit the Old Telegraph Station and The Olive Pink Botanical Gardens before departing on our flight to Melbourne. The Royal Flying Doctor Service of Australia is an air ambulance service for those living in the remote inland areas of Australia. It’s a not-for-profit organization providing both emergency assistance and primary health care to people who can’t easily access a hospital or general practice due to the prohibitive distances of the Outback. At only 100 square kilometers, Phillip Island is famous for its nightly Penguin Parade, but first there is so much more to see! 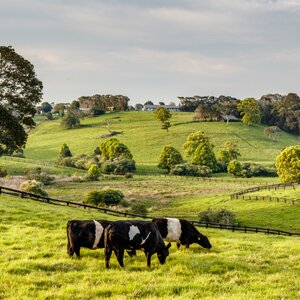 We will experience true Australian hospitality with a tour and delicious lunch at a local cattle farm. Next we have a chance to experience koalas in their natural habitat, and meet them ‘face to face’ on treetop boardwalks at the Koala Conservation Centre. At sunset, we’ll get to see the penguins emerge from the sea and waddle ashore to their sand dune burrows. Our upgraded tickets allow us to view this nightly phenomenon from an exclusive viewing platform and boardwalk limited to 190 people. Sleep in this morning, or perhaps enjoy some time to wander Melbourne’s beautiful alleys and laneways, and pick up a few souvenirs. Later today we’ll enjoy a city tour followed by a special dinner! We don't want to give this one away but it is truly unique. Our morning flight takes us to Sydney where we will board the Ruby Princess. New Zealand’s natural bounty is always on display at the Bay of Plenty. 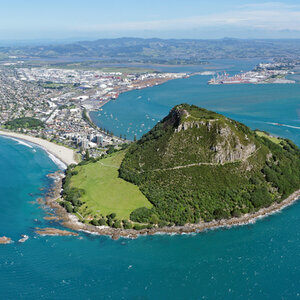 Tauranga, the chief city, is a bustling port, an agricultural and timber center and a popular seaside resort. Tauranga is also the gateway to Rotorua - a geothermal wonderland that is the heart of Maori culture. Napier and Hawke's Bay have become New Zealand's premier lifestyle getaways. Located on the North Island's eastern coast, New Zealand's oldest wine-growing region boasts a superb Mediterranean climate and golden sand beaches. In recent years, Hawke's Bay has become a leading producer of fine olive oils and artisanal cheeses. Wildlife lovers and birders will flock to Cape Kidnappers in Southern Hawke Bay: the Cape is home to the largest mainland gannet colony in the world. 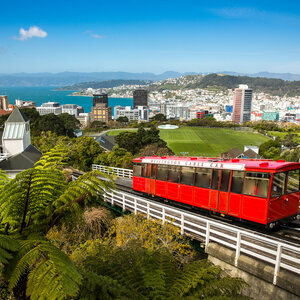 New Zealand’s capital offers stunning views of forested peninsulas, dramatic cliff-side homes and fine Victorian buildings. The sophisticated metropolis boasts museums, winding streets and even a cable car. On the eastern shores of New Zealand’s South Island, Akaroa (tendered) is a popular tourist destination with a distinctly French flair and a history steeped in legend. Akaroa harbour is home to a diverse array of marine life, including rare Hector’s dolphins, and visitors are lured by the area’s secluded beaches and quaint boutiques. Perched on the hills above one of New Zealand’s loveliest harbours, Dunedin is a Kiwi city with a Scottish heart. 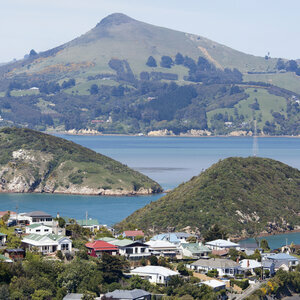 Hailed as the “Edinburgh of New Zealand,” Dunedin is proud of its heritage. 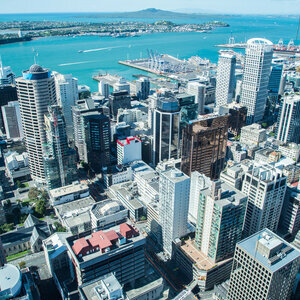 The city also boasts a distinguished architectural and cultural history, a legacy of New Zealand’s 1860s gold rush. Sadly after docking this morning it’s off to the airport for our flights back home. But what friends we have made and memories that will never be forgotten from the world Down Under! G’day mate! Are you ready for an epic adventure down undah? We’re headin’ to Australia & New Zealand for an entire month. That’s right, we figured if we’re going to fly halfway across the world for a vacation, why not make it worth our while and visit two of the most popular bucket list destinations in the world! With so much to see and do, we waste no time as we knock off landmark after landmark, from Sydney to Melbourne and everything in between. To finish off our epic adventure, we hop on Princess Cruise Line’s “Ruby Princess” for a relaxing 12-day cruise through the scenic country of New Zealand! Minimum connection time, schedule changes, and price jumps got you down? Rest easy, we take care of the airfare on this tour. The first step to a good day is breakfast. We want you to have a good day, so we have made sure breakfast is there for you. 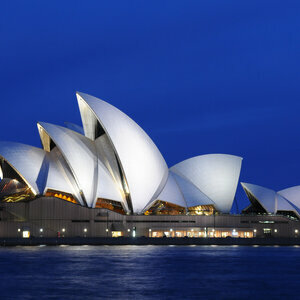 Sydney Opera House is considered one of the 20th century’s most famous & distinctive buildings. Occupying the whole of Bennelong Point in Sydney Harbor, this iconic UNESCO World Heritage Site will not disappoint. 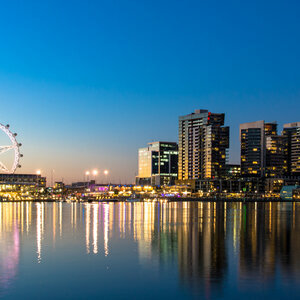 Cruise the world's largest natural harbour and enjoy seeing this amazing city from another angle. Explore Blue Mountains National Park, home to the Three Sisters Sacred Aboriginal site, ancient rainforest, breathtaking views and crimson rosella parrots. Plus, get up close and personal with Australia’s amazing wildlife at Featherdale Wildlife Park. View the world’s largest single structure made by living organisms and its countless species of marine life by glass bottom boat. Then immerse yourself in the crystal-clear waters surrounding Green Island, you may just spot a sea turtle or two. If you’re not into swimming, opt to explore the lush island landscape by taking an eco-walk. Uluru is a large sandstone rock formation sacred to the native Aboriginal people, the Pitjantjatjara Anangu. One of the most notable features of this World Unesco Site it that it is said to change colors. We will get to experience this amazing phenomenon at both sunset and sunrise. Is there any way to experience culture other than through food? We don’t think so, you’ll taste the Outback through mouthwatering BBQ. Nothing is more magical than watching little penguins return home from a day at sea. 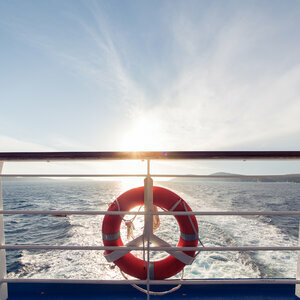 • Port Charges, all taxes and fees of $490.25 per person. • Service charge for Australian Electronic Travel Authority (ETA) which is required to enter the country. • Airline baggage fees for additional or over-sized luggage. • Airline fuel surcharges if there is a change in fuel prices. • * WestWorld Tours exclusive optional excursions. Passport must be valid at least 6 months after the completion of travel. It also must contain sufficient blank pages for entry and exit endorsements. 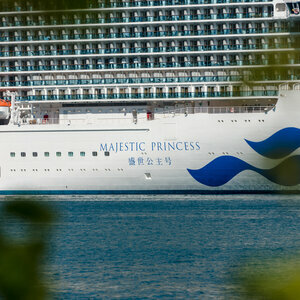 • Port Charges, all taxes and fees of $390.00 per person. We've never travelled or even heard of WestWorld Tours but were impressed when Koral called us a week before (departure) and from then on her attention to detail made the trip very relaxing. Definitely VERY impressed with the quality of the tour & would not hesitate travelling with WestWorld Tours. For me the entire Australia New Zealand tour & experience was wonderful....too many (highlights) to name! This was a Bucket List trip that finally was fulfilled and worth every dollar spent. A Trip Of A Lifetime with so many wonderful places to see and many fantastic attractions. Our 10th trip with WestWorld and once again they provided a worry and hassle free trip with the most Organized and outstanding guide who goes above and beyond. Every day seemed to provide a highlight. 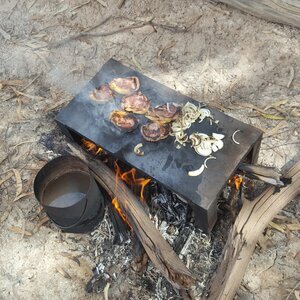 I loved the Outback BBQ, Penguins, the Great Barrier Reef & enthusiastic guides. Absolutely (will recommend this tour to friends) (did we give you value?) Yes the hotels were all great with awesome views. I didn't think it would matter but it was very appreciated. It was great at Featherdale Wildlife Park when we were able to enter as a group as soon as we got there despite there being a long line up. Thanks you for a trip of a lifetime! Once again WestWorld has done a terrific job showing us the highlights of Australia & New Zealand. The accommodations were first class & in great locations. I very much appreciated the BBQ Aussie Style. As well as the Rain Forest, it was a highlight of the trip to be able to sit and smell the forest. In Australia, the trio experienced an Outback BBQ at Alice Springs, enjoyed a performance at the Sydney Opera House, and visited the Featherdale Wildlife Park and the Blue Mountains. They also toured the Great Barrier Reef in a glass-bottom boat and went snorkeling. On Phillip Island they watched the world-famous Penguin Parade. 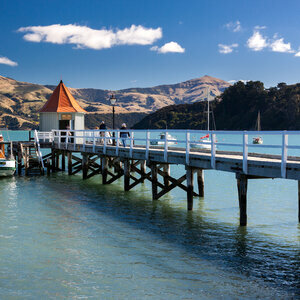 Akaroa, New Zealand featured breathtaking scenery. In Dunedin, the trio walked the steepest residential street in the world and also had a sweet visit at Cadbury World®. 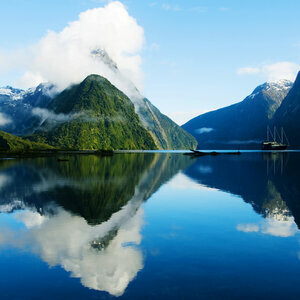 They cruised through Fiordland National Park, a 1.2 million hectare World Heritage site that is comprised of valleys, mountains, lakes, rainforest, native flora and fauna. Shari was impressed with WestWorld Tours. The tour was well-planned and organized, and guide, Koral Carpentier, was amazing. The whole tour was a highlight. Special occasions include Milford, outback BBQ and the Sydney Cruise. WestWorld Tours has done a great job with the tour to Australia and New Zealand. Everything was well organized and with only two off weather afternoons we were treated royally to the sights. We enjoyed the smooth and relaxing cruise. The many ports of call in NZ each had their special interest. Too many highlights to pick from, all were extremely interesting!